Tell us about 'that moment' and be in to win a one-year subscription to New Zealand Weddings magazine. Want to share your love story and have a chance to win a practical yet very pretty prize? 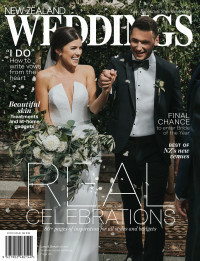 Submit your engagement details to New Zealand Weddings and if your story appears in our print magazine or online at www.newzealandweddings.co.nz, you'll receive a one year subscription to New Zealand Weddings magazine to kick start your wedding planning! COPY THE QUESTIONS BELOW INTO AN EMAIL OR WORD DOCUMENT. COMPLETE THE ANSWERS AND EMAIL THE COMPLETE QUESTIONNAIRE TO [email protected] WITH AT LEAST SIX PICTURES. What date did you get engaged? What are you MOST looking forward to when it comes to wedding planning? What are you LEAST looking forward to when it comes to wedding planning? If you could illustrate you and your partner in emojis, which would they be (paste image or describe emoji for us to use)? Lastly, don't forget to include at least six pictures with your submission. This could be pictures of you as a couple, or something that relates to your engagement (location, ring, your announcement picture/video). We can't wait to 'meet' you!